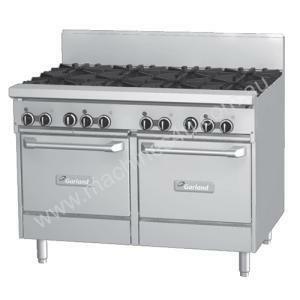 The Garland GF48-2G36LL Heavy Duty Restaurant Range 1200mm wide, 2 burner combination range with 2 space saver ovens. 2 piece burners are easy to remove and clean with protected individual pilot lights and flame failure as standard. Large 686mm deep work surface fits six 300mm pots easily and grate design allows pots to slide across the surface easily. Premium 15mm thick griddle with powerful cast iron ‘H’ burners for even heat distribution.